MEMOFIN - Technical advice on CRA regulatory equivalence - US, Canada and Australia - L'information financière que vous ne trouvez nulle part ailleurs ! On 12 June 2009 the European Commission requested CESR, now ESMA, to provide its technical advice on the equivalence between the legal and supervisory framework of Japan, The United States, and Canada with the EU regulatory regime for credit rating agencies. (Regulation (EC) No. 1060/2009 of the European Parliament and the Council on credit rating agencies1). On 17 November 2009, the Commission also requested CESR to provide its technical advice on Australia. On 28 September 2010, the European Commission published an equivalence decision on Japan. On 15 March 2012, US, Canada, Hong Kong and Singapore. 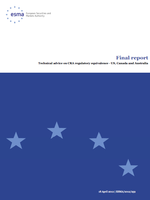 This report sets out ESMA's advice to the European Commission in respect of the equivalence between the US (Part I), Canada (Part II) and Australia (Part III) respective legal and supervisory frameworks and the EU regulatory regime for credit rating agencies. The equivalence assessment conducted by ESMA follows an objective-based approach, where the capability of the n regime in the third country to meet the objectives of the EU Regulation is assessed from a holistic perspective. With regard to the US legal and supervisory framework for credit rating agencies, the updated technical advice to the European Commission published on 20 May 2010 (CESR/10-332) concludes that the requirements directly introduced (through "self-executing" provisions) by the Dodd Frank Act, together with the statutory rules that the SEC is required to issue, provide a solid background for a positive decision on the equivalence of the US legal and supervisory framework for credit rating agencies. In May 2010, CESR had already concluded that the US legal and supervisory framework was sufficiently robust for CESR to conclude that the US framework was broadly equivalent to the EU regulatory regime for credit rating agencies. So therefore we now provide the equivalence technical advice to the European Commission. With regard to Canada, following ESMA's decision to consider the Canadian regulatory regime as being in line with the requirements defined in Article 4(3) of the EU Regulation on CRA, the assessment concludes that the Canadian legal and supervisory framework for credit rating agencies is equivalent to the EU regulatory regime for credit rating agencies. However, only if all the conditions set out in Article 5(1) of the EU Regulation are met, can a third country CRA be granted certification. The same conclusions apply to the Australian legal and supervisory framework for credit rating agencies, where the assessment is also to deem the regime to be equivalent to the EU regulatory regime for credit rating agencies.